Sergey Sobyanin announces his snap resignation, setting up a direct election for mayor on Sept. 8. Moscow’s mayor, Sergei Sobyanin, announced Tuesday he is stepping down two years early to stand for a new term in office. Sobyanin suggested that the new mayoral election – Moscow’s first in 10 years – would take place on Sept. 8, the same day as the election for governor is scheduled to take place in the surrounding Moscow Region. The maneuver is largely being viewed as an effort to secure a five-year mayoral term at a time when his strongest potential opponents, billionaire Mikhail Prokhorov and opposition activist Alexei Navalny, are likely to be deterred from running. Sobyanin announced his decision on June 4 at a meeting of Moscow’s Public Chamber, where its members urged Sobyanin, appointed mayor by then-President Dmitry Medvedev in 2010, to call early elections to boost his legitimacy among Muscovites. He is thought likely to continue as acting mayor after formally submitting his resignation to President Vladimir Putin, in the period leading up to the new mayoral election. Sobyanin, 54, served from 2005 to 2010 as presidential chief of staff. Before that, he was elected governor of Russia’s richest oil and gas-bearing province, Tyumen Region, in 2001. Since Sobyanin took over as Moscow mayor he has conducted a thorough review of the policies of his predecessor, Yury Luzhkov, and replaced many of his cronies at City Hall. Luzhkov was dismissed by Medvedev after 18 years in office in September 2010 over “a loss of trust” after a media campaign accused his administration of rampant corruption. Moscow’s last mayoral election took place in 2003, when Luzhkov polled 75 percent of the vote. In September 2004, after the Beslan terrorist attack in the North Caucasus, Vladimir Putin scrapped popular votes for governors and the mayors of Moscow and St. Petersburg in a move interpreted as strengthening the Kremlin’s control of regional elites. Last June, popular votes for regional leaders were restored with certain limitations in what political experts referred to as a concession to anti-Kremlin middle-class protesters, who were demanding more self-governance in big cities, primarily Moscow. A survey conducted in February by the Public Opinion Foundation, a state-funded national polling agency, showed that 51 percent of Muscovites approved of Sobyanin’s performance, while 23 percent were critical of it. Fifty-nine percent of respondents said Moscow would benefit if Sobyanin remained in office, while 14 percent disagreed. 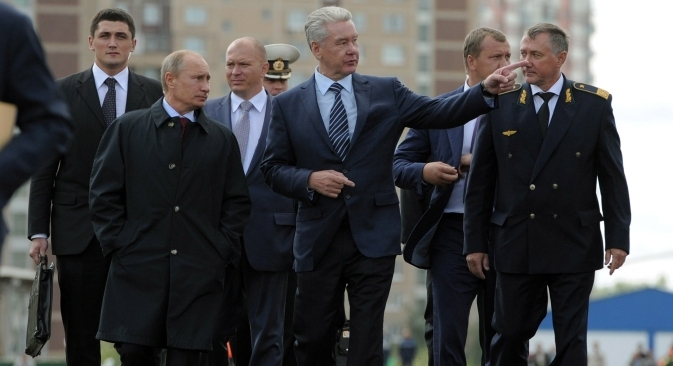 Sobyanin’s personal approval rating in Moscow was 66 percent, the poll found. The rumor was confirmed by a municipal deputy in Moscow’s Otradnoye district, Mikhail Velmakin, who told Gazeta.ru that members of Moscow election commissions were recently asked not to go on vacation in September, even though there were no elections scheduled for that month in Moscow. Gazeta.ru quoted the editor-in-chief of Moscow news portal Mossovet, Yury Zagrebnoy, as saying that holding elections in September would prevent Mikhail Prokhorov, a billionaire and liberal politician, from running for mayor. On June 1, a law came into effect to ban deputies, mayors and governors from having accounts and business assets abroad. On May 29, Prokhorov told the RBC business portal that he would move his assets to Russia by 2014 to qualify as a candidate in elections to Moscow’s legislature, the City Duma, scheduled for September 2014. Prokhorov currently has higher support in Moscow than in any other Russian region. He placed second after Vladimir Putin in March 2012’s presidential election in Moscow, garnering 20.5 percent of the vote, while his national result was 8 percent. Putin scored 47 percent in Moscow and 64 percent across Russia. Lev Gudkov, head of the Levada Centre, an independent pollster, estimates that Prokhorov could potentially poll 20 to 25 percent in a September election. Another popular politician in Moscow, anti-corruption crusader Alexei Navalny, a much fiercer critic of Putin than Prokhorov, told Ekho Moskvy radio on June 4 that he wanted to stand for mayor. Like Prokhorov, Navalny’s chances of running for mayor in September are problematical, but for a different reason. Navalny is being tried on fraud charges that oppositionists claim are trumped-up and politically motivated. If convicted, Navalny would be denied the right to take elective office. Alexei Venediktov, editor-in-chief of Ekho Moskvy, said that Sobyanin had made a pre-emptive strike against his challengers while they were too weak to take him on. “In 2015, the competition would be harder for him – the risk of losing would be much higher in 2015 than in 2013,” Venediktov wrote on his Twitter account. Winning the election will boost Sobyanin’s legitimacy, Makarkin said.